Martyr of Liberty Broadside. Folger Shakespeare Library. Last year, as part of the Wonder of Will exhibition extravaganza to commemorate the 400th anniversary of Shakespeare’s death, the Folger presented America’s Shakespeare. This exhibition took a look at the Bard’s influence on American thought and popular culture from the “Be taxt, or not be taxt” political cartoons at the dawn of the Revolution, to the countless reimaginings of Shakespeare’s works in recent literature and film. Who is Shakespeare to Americans, and how has the U.S. made Shakespeare our own? One of the most striking stories involves a strange and eerie connection between Abraham Lincoln’s assassination and Shakespeare’s Macbeth. It’s not only a fascinating tale, but the digitized versions of original documents at the Folger and other U.S. institutions have provided a wonderful opportunity to show students how to tell a story using primary sources. The three items in the exhibition that told our story were a letter written by Lincoln to his favorite actor, a broadside lamenting Lincoln’s death, and a page from Lincoln’s assassin, John Wilkes Booth’s, diary. Macbeth is represented in each one of them. Abraham Lincoln was the President during the Civil War. 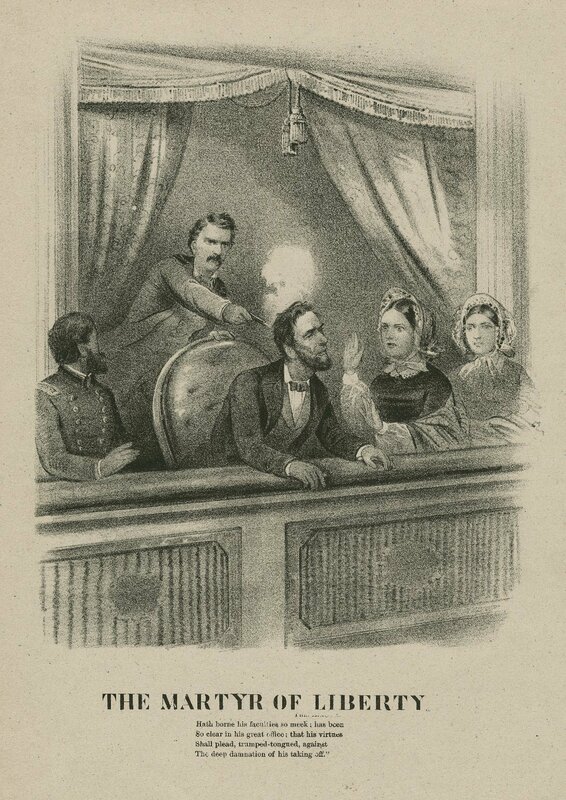 Abraham Lincoln was assassinated at Ford’s Theatre on April 14th, 1865 by John Wilkes Booth, who saw Lincoln as a tyrant. Shakespeare was in the collective mind of the Nation. Abbreviated works appeared in school books and his poetry and plays were commonly taught, so the average American would have been familiar with his words. It would be interesting to put the two Hamlet soliloquies side by side and compare them. Keep in mind that the Civil War was seen as a war between brothers, and Lincoln was tormented over it. A great, open-ended question for students: why might Lincoln prefer Claudius’ speech over one of the most famous speeches in all of literature? These lines are from a scene where Macbeth is lauding King Duncan, a man he plans to murder, for being so virtuous a ruler that his legacy would speak for him after death. The American public quickly made the connection between the two assassinations and used Shakespeare’s words to express their bereavement for their own leader who was unjustly struck down. Click here for the third and final primary source in this story—and a complete list of Macbeth-Lincoln sources to use in class! Kate Haase is Manager of Visitor Education Programs at the Folger. She develops programming for visiting families and students, supports the fabulous Folger Docent Corps, and spends most of her off hours developing new configurations to fit all of her books on one set of shelves.